Scamp Theatre’s big-stage adaptation of Julia Donaldson and Axel Scheffler’s young children’s bestseller The Scarecrows’ Wedding is a highly entertaining all-family show, boosting this company’s established reputation for children’s theatre. 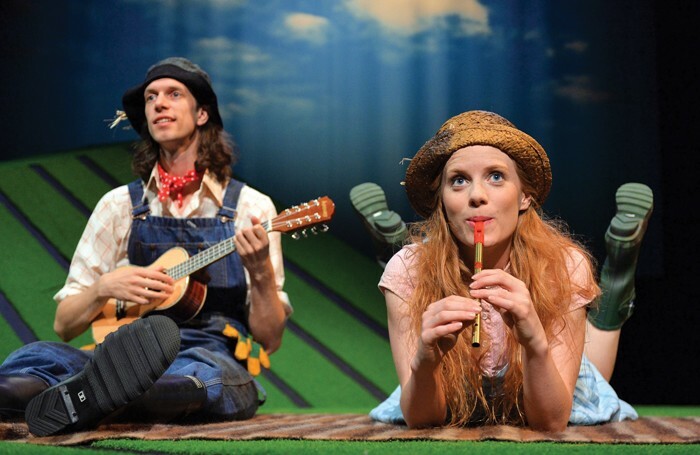 Its seamless direction by Eva Sampson, an enchanting and often hilarious mix of well-paced scenes, Darren Clark’s appealingly simple songs such as Passing of the Seasons and Love of a Scarecrow, the ingenious use of rustic props on James Button’s green hillside set and plentiful comedy make this production a sure-fire success for toddlers-plus audiences. Betty O’Barley and Harry O’Hay, two jolly scarecrows who dance, play and picnic, plan to get married. But when Harry sets off to buy his true love wedding presents, the farmer thinks he has gone forever. Needing a replacement, he imports Reginald Rake from France, who soon dashingly professes his affection for Betty in his fast car – but Harry returns just in time for the confetti-covered wedding finale. Muireann Bird and Edward Day hugely please as Betty and Harry, rollicking through rural scenes and singing to mini-accordion and banjo strains. Paul Brendan is amusingly versatile as the farmer, Reginald Rake and assorted animals. The use of props constantly amuses: the farmer’s white socks become a pair of geese, a clothes-line with bells represent make-believe cows, black gloves on sticks are flapping crows and a green spacehopper becomes a pompous toad. It all adds up to bags of sheer family fun.